The marae Ahu O Mahine in Mo‘orea’s Opunohu Valley still has a largely intact altar at one end, as well as the three small standing stones where the chiefs and priests sat. This marae was dedicated to ‘Oro, a god of fertility and war. His worship required human sacrifices. 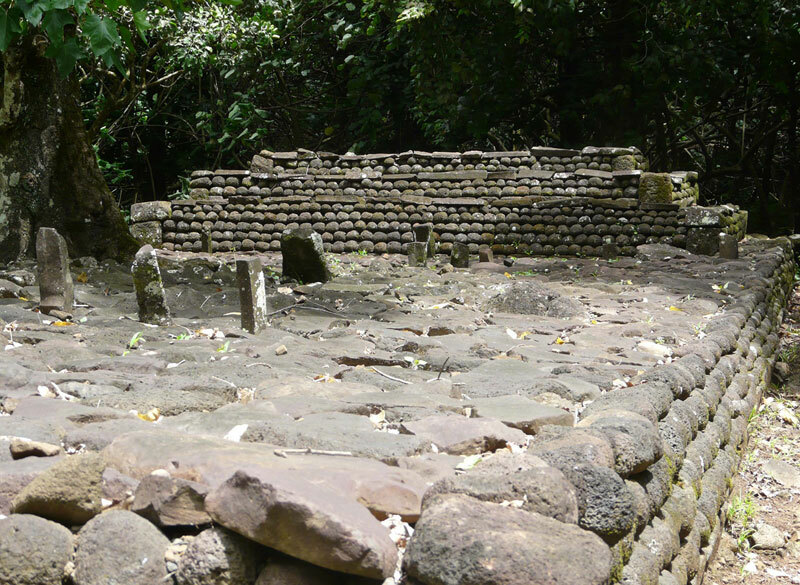 THE STONE RUINS of French Polynesia aren’t as impressive as those at Maya sites like Tikal or Palenque in Central America, but both share a sturdy construction, are often deep in the jungle, and exude mystery. “A place of dread and great silence was the marae,” wrote Teuira Henry in Ancient Tahiti , a history published in 1928. The marae, a stone platform, was where the gods communicated with the Polynesians and political, social and religious decisions were made. The marae was tapu—sacrosanct. To violate it was to call down the gods’ wrath. On Mo‘orea, 10 minutes from Tahiti by plane (30-45 minutes by ferry), the largest collection of maraes is in the Opunohu Valley. More than 550 structures have been uncovered, including more than 100 maraes. A paved, five-kilometre road leads up the valley from Opunohu Bay. About four kilometres along is a small parking lot on your left. In the forest next to it, overgrown by mape (Tahitian chestnut) trees and crowded by the waxy leaves of the Miconia shrub is the biggest of the valley’s maraes, Titiroa (or Ti‘i-rua), 36 metres long. Before Europeans came to Polynesia in numbers in the 19th century the Opunohu Valley was home to a substantial population, but Western diseases and missionaries emptied the land and its maraes, letting the jungle, and silence, take over. Park your car, kill the engine and allow the stillness to settle. Walk into the woods and around the Titiroa marae. The remains of the altar are at one end; towards the centre of the platform are small standing stones where the chiefs and priests sat. There are paths through the trees left and right from Titiroa. Hike uphill and you’ll come to another marae, Afareaito, and beyond it two shooting platforms. Here, nobles knelt to compete in archery games, firing arrows through a cleared corridor in the forest, trying to shoot further than 240 metres. Spotters stationed in the trees signaled as the arrow passed by. You’re likely to have these sites to yourself—you, some chickens and roosters, and probably mosquitoes. Your fellow travellers are at the beach. It is, after all, the clear, warm waters and white sandy shores that bring most people to French Polynesia. Another of its islands, Bora Bora, was thought the most beautiful in the world by author James Michener, of South Pacific fame. Travel guide writer Arthur Frommer felt the title ought to go to Mo‘orea. Drive another kilometre up the Opunohu Bay road and see for yourself how he reached his conclusion. The road ends at a lookout, the Belvédère. Dominating the view is the dark-green hulk of Mount Rotui, its saw-toothed ridges separating sparkling Cook’s and Opunohu bays. “Nothing compares,” wrote Frommer. For information on French Polynesia visit the Tahiti Tourisme website at www.tahiti-tourisme.pf.